Built in 1949, this mid-century modern home on Forest is one of more than a dozen other homes designed and constructed by Edward Hawkins. That same year Hawkins purchased the land to develop a subdivision that would later become realized as Arapahoe Acres. It is there that Hawkins’ influence of/on modern architecture is overwhelmingly apparent. In 2007 this home was found in disrepair. The renovation is sensitive to the simplicity of the floor plan, the materials, and Hawkins’ innovative attempt at passive/solar construction. The addition emphasizes certain historic gestures (facade banding, floor/ceiling glass, brise soleil) while establishing a sense of newness. This poroject was done in collaboration with Denver Artist and Design-Builder Bill McDonald, owner of McDonald Reconstruction. 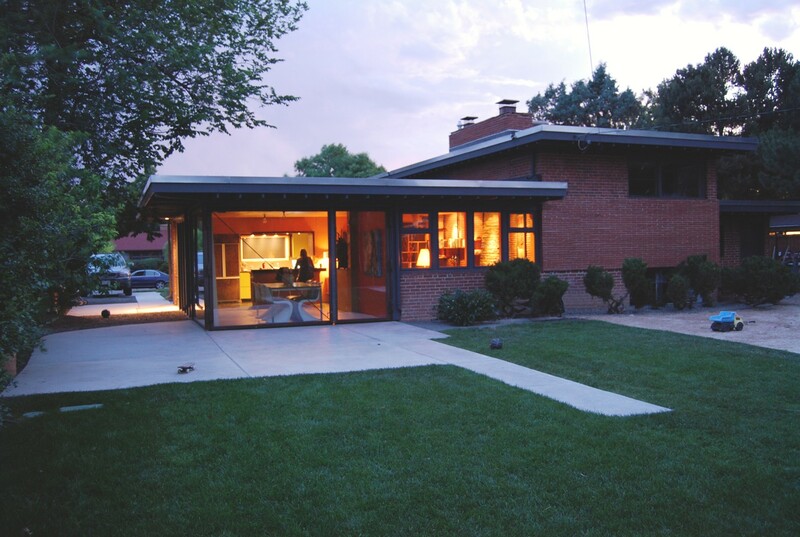 His dedication to maintaining the original character of the houses he reconstructs has been influential in refurbishing several Hawkins Houses in Park Hill. You can also find his signature touch throughout the project through custom mill and metal work. The interior design for this project was done in collaboration with Terri Peters of Peters Windley Design. Her amazing eye for color and relentless search for materials were instrumental to the success of its transformation, they not only fit the budget but also the strong aesthetic of the house.